Building upon previous research, researchers at the University of California, San Diego School of Medicine and Veteran's Affairs San Diego Healthcare System report that neurons derived from human induced pluripotent stem cells (iPSCs) and grafted into rats after a spinal cord injury produced cells with tens of thousands of axons extending virtually the entire length of the animals' central nervous system. Leading author Paul Lu, PhD, of the UC San Diego Department of Neurosciences said the human iPSCs-derived axons extended through the white matter of the injury sites, frequently penetrating adjacent gray matter to form synapses with rat neurons. Similarly, rat motor axons pierced the human iPSCs grafts to form their own synapses. The iPSCs used were developed from a healthy 86-year-old human male. "These findings indicate that intrinsic neuronal mechanisms readily overcome the barriers created by a spinal cord injury to extend many axons over very long distances, and that these capabilities persist even in neurons reprogrammed from very aged human cells." said senior author Mark Tuszynski, MD, PhD, professor of Neurosciences and director of the UC San Diego Center for Neural Repair. For several years, Tuszynski and colleagues have been steadily chipping away at the notion that a spinal cord injury necessarily results in permanent dysfunction and paralysis. Earlier work has shown that grafted stem cells reprogrammed to become neurons can, in fact, form new, functional circuits across an injury site, with the treated animals experiencing some restored ability to move affected limbs. The new findings underscore the potential of iPSCs-based therapy and suggest a host of new studies and questions to be asked, such as whether axons can be guided and how will they develop, function and mature over longer periods of time. Image depicts extension of human axons into host adult rat white matter and gray matter three months after spinal cord injury and transplantation of human induced pluripotent stem cell-derived neurons. Green fluorescent protein identifies human graft-derived axons, myelin (red) indicates host rat spinal cord white matter and blue marks host rat gray matter. While neural stem cell therapies are already advancing to clinical trials, this research raises cautionary notes about moving to human therapy too quickly, said Tuszynski. "The enormous outgrowth of axons to many regions of the spinal cord and even deeply into the brain raises questions of possible harmful side effects if axons are mistargeted. We also need to learn if the new connections formed by axons are stable over time, and if implanted human neural stem cells are maturing on a human time frame -- months to years -- or more rapidly. If maturity is reached on a human time frame, it could take months to years to observe functional benefits or problems in human clinical trials." In the latest work, Lu, Tuszynski and colleagues converted skin cells from a healthy 86-year-old man into iPSCs, which possess the ability to become almost any kind of cell. The iPSCs were then reprogrammed to become neurons in collaboration with the laboratory of Larry Goldstein, PhD, director of the UC San Diego Sanford Stem Cell Clinical Center. The new human neurons were subsequently embedded in a matrix containing growth factors and grafted into two-week-old spinal cord injuries in rats. Three months later, researchers examined the post-transplantation injury sites. They found biomarkers indicating the presence of mature neurons and extensive axonal growth across long distances in the rats' spinal cords, even extending into the brain. 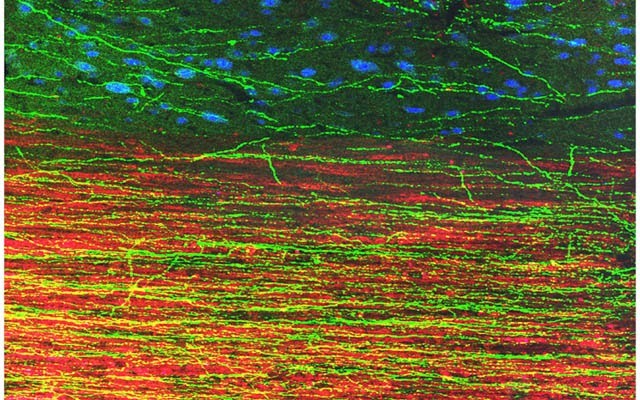 The axons traversed wound tissues to penetrate and connect with existing rat neurons. Similarly, rat neurons extended axons into the grafted material and cells. The transplants produced no detectable tumors. While numerous connections were formed between the implanted human cells and rat cells, functional recovery was not found. However, Lu noted that tests assessed the rats' skilled use of the hand. Simpler assays of leg movement could still show benefit. Also, several iPSCs grafts contained scars that may have blocked beneficial effects of new connections. Continuing research seeks to optimize transplantation methods to eliminate scar formation. Tuszynski said he and his team are attempting to identify the most promising neural stem cell type for repairing spinal cord injuries. They are testing iPSCs, embryonic stem cell-derived cells and other stem cell types. "Ninety-five percent of human clinical trials fail. We are trying to do as much as we possibly can to identify the best way of translating neural stem cell therapies for spinal cord injury to patients. It's easy to forge ahead with incomplete information, but the risk of doing so is greater likelihood of another failed clinical trial. We want to determine as best we can the optimal cell type and best method for human translation so that we can move ahead rationally and, with some luck, successfully." - Lu et al. Long-Distance Axonal Growth from Human Induced Pluripotent Stem Cells After Spinal Cord Injury. Neuron, 2014.